As part of our ongoing monitoring of market conditions, our quarterly Markets Updates provide an overview of SME finance markets, drawing on the latest evidence on estimates of stocks and flows of external finance used by SMEs in the UK. This includes bank lending, equity deals and asset finance. This quarterly Markets Update focuses on the current significant uncertainty about Brexit. It covers the potential impact of the uncertainty on the economy, business confidence and SME finance markets in the UK. Economic growth in the UK has slowed. Real GDP rose 0.2% in Q4 2018 compared to the previous quarter, according to the Office of National Statistics. This was the weakest since early 2018. Consequently, economic growth eased to 1.4% in 2018, a six-year low. Real GDP growth picked up slightly in January 2019 but there are signs this was partly due to businesses building up stocks in anticipation of potential Brexit-related disruption rather than an underlying improvement. The economy grew 0.5% compared to December 2018, which was the strongest monthly expansion in more than two years. However, it is worth treating monthly data with caution because it can be subject to significant revisions. The manufacturing sector was one of the main drivers of the stronger GDP growth. This chimes with the IHS Markit purchasing managers’ index for manufacturing recently reporting sharp rises in inventories. In February more than two-thirds of manufacturers that offered a reason behind the build-up of stocks attributed it to Brexit. In terms of the whole economy, the Bank of England March 2019 Agents’ survey on preparations for EU withdrawal reported that around two-fifths of all respondents have been building inventories. Business investment has underperformed economic growth. The ONS reported that business investment fell 0.9% in Q4 2018 compared to the previous quarter. This was the fourth consecutive drop and the largest in two years. By asset, the largest decline was in investment in ICT equipment and other machinery and equipment, followed by intellectual property products. There are signs that business investment has weakened further. The Bank of England Q1 2019 Agent’s summary of business conditions reported that investment intentions fell sharply in manufacturing, mostly due to Brexit uncertainty. There was also a modest decline in the services sectors. The Bank of England and Office for Budget Responsibility recently revised down their economic and business investment forecasts for 2019. Both now expect the economy to grow modestly this year (1.2%). However, their forecasts of business investment diverge: the OBR sees a small expansion (1%) while the BoE expects a decline (-2.75%). The uncertainty associated with Brexit has also weighed on the confidence of businesses about their prospects for the coming months. This suggests that activity will slow further. The FSB Small Business Index fell to a post referendum low of -9.9 in Q4 2018 and remained in negative territory at -5.0 in Q1 2019. Similarly, the CBI Business Optimism Index – which covers manufacturing firms of all sizes – has declined by 15% since the referendum. The index was a small negative (-5) in Q2 2016, which was broadly in line with the long-term average. By Q1 2019 the index had dropped deeper into negative territory (-23). Both gross new bank lending to – and loan repayments by – SMEs in January and February 2019 were up strongly compared to the same period last year, according to Bank of England data. Gross new loans (excluding overdrafts) totaled £9.65 billion in the first two months of the year. This is up by 13% from £8.52 billion on the same period of 2018. British Business Bank market intelligence suggests there is little appetite among borrowers to invest for growth. This is consistent with the recent weakness of business investment, which indicates that Brexit uncertainty is weighing on the use of medium and long-term loans. A possible explanation for the higher gross lending is that some SMEs have increased their use of short-term loans to cover the costs associated with preparing for Brexit. For example, evidence suggests those that are stockpiling ahead of a potential No Deal Brexit are likely to face extra costs such as renting additional warehouse storage space. Loans of a shorter rather than longer duration would be more appropriate to cover such costs. There are other signs of an increase in short-term borrowing by SMEs. Our market contacts suggest some smaller businesses have increased their use of bank overdrafts as working capital ahead of potential Brexit-related disruption. This chimes with the SME Finance Monitor for Q4 2018 which showed that the share of smaller businesses using bank overdrafts rose for the third consecutive quarter to 22%, a six-year high. It’s possible SMEs are using the working capital to manage cash flow and buy stock ahead of Brexit. Loan repayments by SMEs totaled £9.74 billion in January and February 2019. 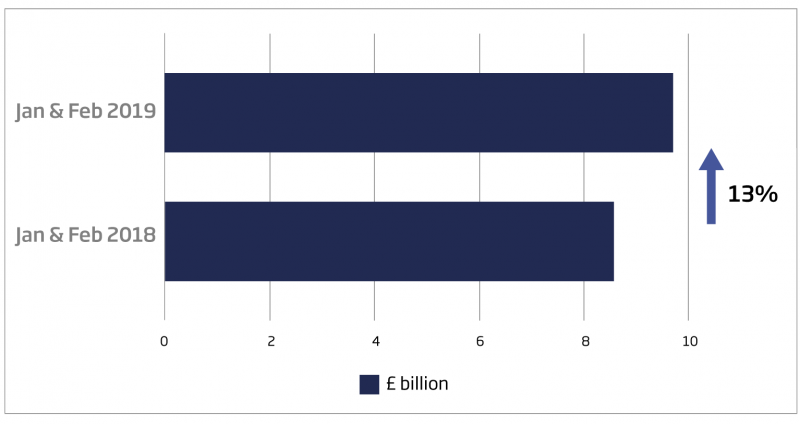 This is 12% higher than £8.67 billion in the corresponding period of last year. This suggests the uncertain economic environment has led some SMEs to pay down debt to strengthen their balance sheets before Brexit. Gross new lending falling short of repayments in the first two months of 2019 led to slightly negative net lending of £0.1 billion. This is broadly unchanged from the negative net lending of £0.2 billion in the same period of 2018. The total value of new asset finance to smaller businesses in 2018 was around £18.9 billion, according to data from the Finance and Leasing Association. This is up by about 3% on the previous year. However, it is slower than the growth of approximately 10% seen between 2016 and 2017. The slower growth in asset finance is consistent with the recent decline in business investment. SME asset finance got off to a good start in 2019. In January and February combined, £2.7 billion of new asset finance went to smaller businesses, which was up 10% on the same period of 2018. However, it’s too early to tell if the improvement will be sustained. 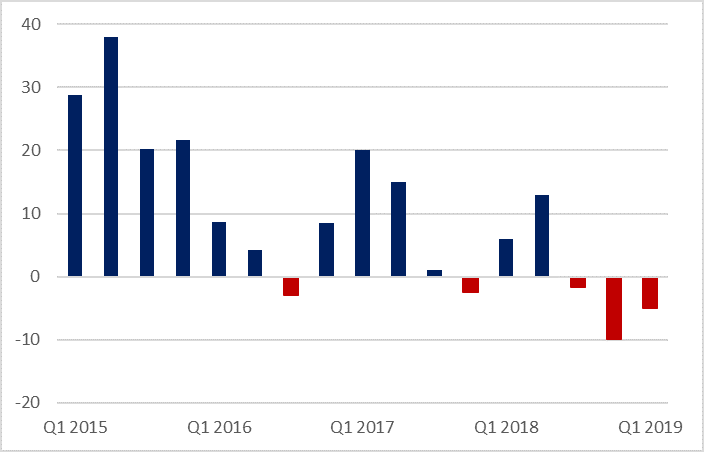 Equity finance in UK smaller businesses ended 2018 strongly, according to our analysis of Beauhurst data. Both investment and deal numbers in Q4 2018 were up from the previous quarter. In 2018 UK SMEs received £6.7bn of equity investment, a 5% increase compared to 2017. 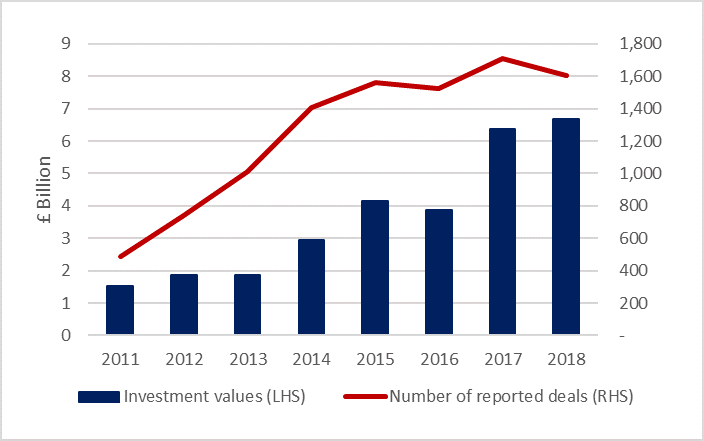 The number of reported equity deals fell 6% to 1,603 in 2018 but remained higher than in 2016. This was driven by the seed stage, which dropped 12%. 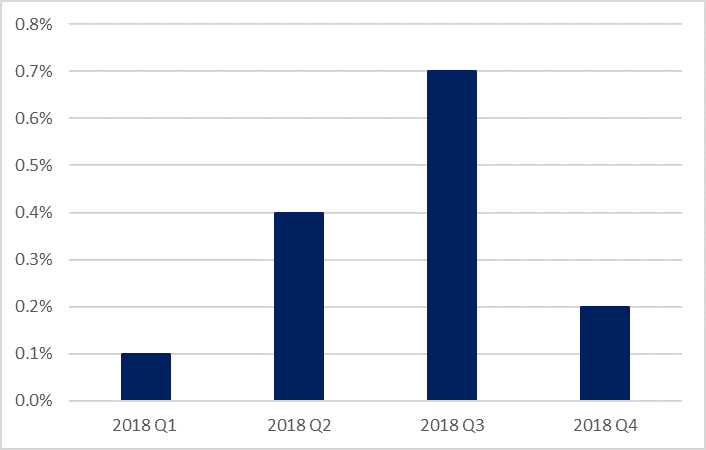 Despite the number of deals declining in 2018, equity investment grew due to an increase in deal sizes. 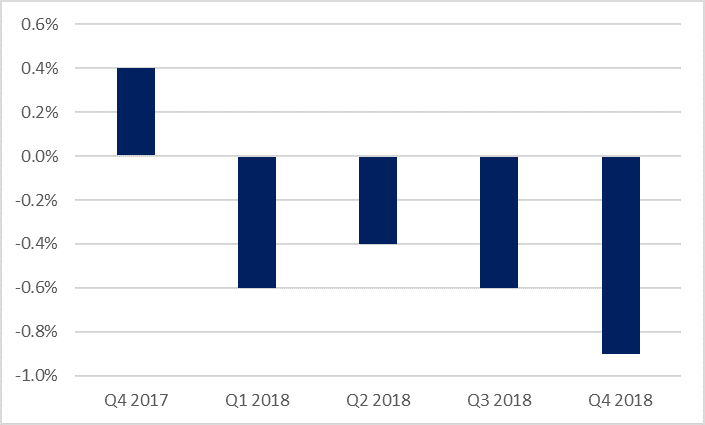 Our market intelligence suggests that the value of equity investment in SMEs in Q1 2019 will be lower than in the final quarter of 2018. The first quarter of 2019 saw alternative providers of finance to SMEs raise additional funding even though the economic environment was difficult. Examples include Beechbrook Capital, a specialist fund manager, reaching first close of its second SME UK credit fund, making commitments of £128 million. British Business Investments has supported both its first and second SME credit funds. Also, the challenger bank OakNorth secured a guarantee of £133 million from our ENABLE programme to further strengthen its lending support to fast-growth businesses, established property developers and investors. Such activity indicates that the diversity and structure of SME finance markets has continued to develop, giving SMEs a wider range of options when seeking finance. The following table brings together the latest data from multiple sources, to present a snapshot of the current values of various types of external finance – and the number of reported deals for equity investment – provided to UK smaller businesses. Our 2018/19 Small Business Finance Markets report looks at market developments in more detail including regional comparisons and deeper dives into the demand side. some double counting across estimates in different parts of the table. Flows data are cumulative totals for the year or to the date stated. Non-seasonally adjusted. (b) Data exclude overdrafts and covers loans in both sterling and foreign currency, expressed in sterling. The table below contains historical data for the FSB Small Business Index.